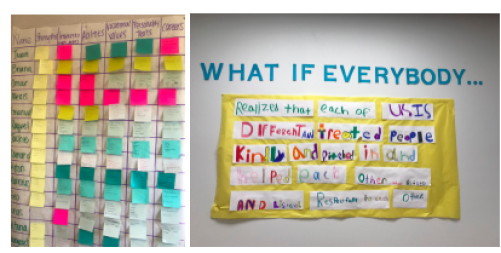 Students collaborate and drive their learning at Design39Campus, a public school in San Diego's Poway school district where student voice and choice is embedded into the entire learning process. I often advocate going beyond your classroom and school to see other learning styles and approaches, and drive inspiration. I feel very fortunate to have been to at least 100 schools this year, including our amazing partner schools and diverse public, charter, independent, urban, rural, and suburban schools. Through these visits and in conversations with many educators, students, and parents, I have seen tremendous shifts in our education system. This paradigm shift from teacher-centered to learner-centered is changing how we see learners and their critical role in their own learning, now and throughout their lives. Education Reimagined highlights that in this paradigm: Learners are seen and known as wondrous, curious individuals with vast capabilities and limitless potential. Here are five trends in schools that are empowering students to drive their learning in authentic and meaningful ways. 1. Authentic Problem Solving: Little people are capable of solving big problems. Students of all ages can have a tremendous influence on their community and the world. I saw so many great examples of students making an impact. For example, fourth graders at the Desert Learning Academy in Palm Springs have been researching the impact of straws on the environment. They have shifted the mindset at school to be more environmentally friendly and are even influencing city council to ban straws. To do this, they did research to better understand the impact that humans are having on the environment and created a public service announcement to help others take action to improve the environment. They made a commitment to ban plastic straws in their classroom, are influencing school-wide procedures, and creating awareness in their community. In partnership with AltSchool, they have created authentic projects and helped learners drive their learning and capture evidence of their learning and impact. Check out the news story here. 2. Investing in Relationships: They are the foundation for powerful learning. What often stands out to me is the relationships between educators and students. This year I was encouraged to see so many interactions that highlighted genuine care for one another. At Calavera Hills Middle School and Design 39 Campus, as I walked through the halls and in and out of classrooms I noticed happy educators and students. Educators were treated with respect and were looked to for answers and ideas while students were valued and celebrated. I love seeing the learning community celebrating each other and students who feel comfortable laughing with one another and their teachers. 3. Sharing Learning: When learners have an authentic audience they are more invested. When students have an authentic purpose and audience beyond their teacher to share what they are learning, they are more motivated to learn and often go above and beyond. I am excited to see more schools moving toward structures that empower learners to share through portfolios and student-led conferences. Students have to share their learning process and illustrate it to adults and their peers, which makes learning real and empowers learners to take ownership of the process. Opportunities for learners to share their work beyond the classroom in student-led exhibitions can be powerful in ensuring students have an authentic audience and are doing work that has value. Students documenting and capturing evidence of their learning journey is also one of the most exciting things that I have seen and I love how even kindergartners are able to do this at Arcadia Unified. 4. Co-constructing Learning: When learners have agency, they help chart the course and drive their own learning. We know from decades of research on motivation that autonomy and purpose are critical in learning. If we want a learner to be motivated we need to provide opportunities that allow them to engage in authentic tasks, foster autonomy, invite the pursuit of mastery, and intrigue them with a sense of purpose. Although I would not say this is the norm yet, I have seen great examples in Lindsay Unified, at AltSchool’s lab schools, and throughout Arcadia Unified where students are setting goals in collaboration with teachers and peers, charting their course of action, and working along the path to mastery. I look forward to seeing this practice expand for both students and educators. 5. Celebrating Diversity: Learner variance is the norm—we all win when we embrace it. I continue to see more educators and systems designed to empower learners to understand their unique strengths, ask more questions, and pursue their goals to chart personal paths. I see more celebrations of individuals, like at Odyssey STEM Academy where students chart their strengths and goals leveraging AltSchool’s platform. In recognition of the diversity of learners, I see more targeted, small-group instruction rather than teaching to the middle (or no one). We are recognizing that learning is personal and moving toward learner-centered approaches that honor the uniqueness of learners. Also, we are creating more opportunities and structures that empower learners to move from their point A to their point B. These trends are encouraging and these positive shifts mark progress in creating new and better opportunities for learners across the country. But I would be remiss if I didn’t acknowledge that access and opportunities vary widely across the country. As I see so many great things happening I also feel a tremendous sense of urgency to make these experiences the norm throughout education for all children. While at times it can feel daunting to think about the enormous challenges of shifting entire systems—whether it be in the classroom, a school, a district, or the whole nation—I know it’s possible and it’s so important to look at the progress we continue to make. Keep sharing, connecting, and pushing each other and the system to improve and meet the needs of the learners in our classrooms. Interested in bringing learner-centered practices to your school? We meet you where you are and partner every step of the way from district and school transformation to classroom implementation. Get in touch with Katie and our team.